Home, 1995, Ink & Color on Shaun Paper, 26.75" x 26.75"
Work 1994, 1994, Ink & Color on Shaun Paper, 26.75" x 26.75"
Emotion Transported, 2000, Ink on Shuan Paper, 18" x 16.5"
Mountain Living 2004, Ink and Color on Shuan Paper, 18" x 16.5"
Hua Mountain After the Rain, 2005, Ink and Color on Shuan Paper, 18" x 16.5"
West Mountain, 2009, Ink on Shuan Paper, 18" x 16.5"
Born in 1962. 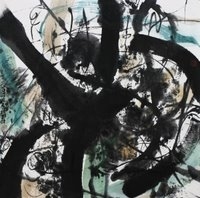 He is a self-taught artist, having practiced Chinese calligraphy, poetry, and traditional ink on paper painting from a very young age. When the Cultural Revolution (1966-1976) began, he was just four years old. Like all Chinese who grew up during that period, Zheng did not get a regular education as all schools were shut down. 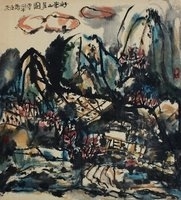 After the Cultural Revolution, he worked in a state owned factory, but soon quit that post to devote himself fully to modern ink painting. 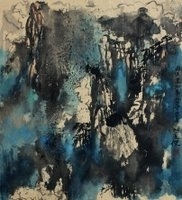 In 1986, while still in his early twenties, Zheng founded one of the first night schools of fine art in Beijing. In 1990, Zheng began visiting the Si Ma Tai section of the Great Wall, which eventually became an important site of his performance works. He first gained international attention in 1993 for his performance “Binding the Lost Soul: Huge Explosion.” He and a group of performers, including students, villagers, and other artists, salvaged bricks from a crumbling portion of the Great Wall and tied red ribbons around them. The process, and the resultant hill of beribboned bricks, was both a celebration of the Great Wall and an elegy to it. In recent years Zheng Lianjie has continued to explore historical memory, human endurance, and personal identity through his physically intense and visually stunning performances. 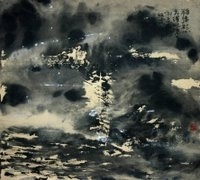 He also continues to practice ink painting, to which he adds his own element of dramatic energy. The Contemporary Ink on Paper work symbolizes the artists' acknowledgement of and intimacy with the traditional culture at a mature level. 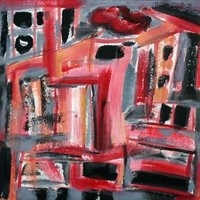 As an overseas Chinese artist, I feel free and lonely facing the contrast of two cultures. I see the core of human nature. I embrace my mother tongue as a drifter. At the same time, I defend the dignity of an individual. After I returned from my fifth trip to Hua Mountain in 2004, my work showed my deeper understanding Taoism. My pursuit is now more focused on the simplicity of flower and grass, the grandeur of mountain and water. 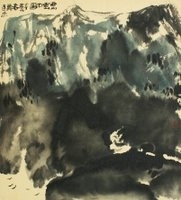 The splashing ink paintings reflect my nostalgia towards my hometown, the West Mountain, my journey through the East and the West, in various times and places. I challenge myself constantly in my pursuit of ink art for over thirty years. The passing memories and the ancient symbols run through my emotions all the time. I have traveled in dust-filled paths to seek the love blessed by nature. I dreamed of pain. I have fought against darkness. All I want to do is to define today with creativeness of mine and continuity of tradition. At times, I feel at risk after living in the city for a while. It is like my skin is covered by mud. If I do not see forest, wild grass, and compassion, my work becomes dull. I become a drifter in a make-believe world. Walking in the streets of Manhattan, I see cloud and fog surrounding the skyscrappers, overlapped with the images of passer-by in different times.